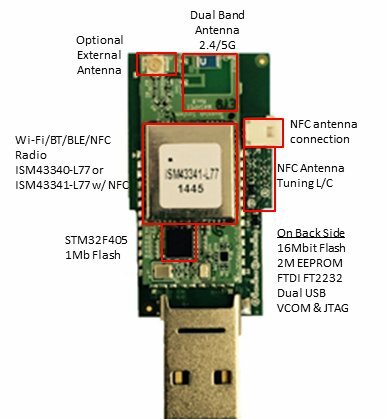 Quality wireless combo module providing the highest level of integration available for an IoT device. Bridges BLE sensors to Wi-Fi. Includes a dual band (2.4 GHz and 5 GHz) IEEE 802.11 a/b/g/n MAC / Baseband / Radio, Bluetooth Low Energy (BLE), Bluetooth 4.0 and NFC. 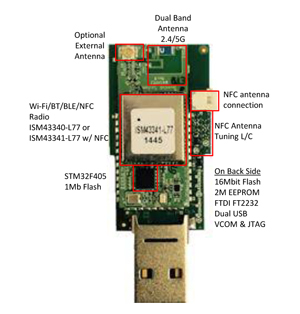 The module implements the Broadcom BCM43340 or the BCM43341, single-chip, combo-radio device an external Flash memory for over the air update. Simply install the USB drivers and you can run the IWIN AT commands (In development) to communicate with eS-WiFi or you can install Broadcom WICED SDK to get started.